Undoubtedly, people who use wallet services that support both Dash (DASH) and Dashcoin (DSH) have gotten confused over which coin is which. These users have been confusing the two altcoins as related currencies, when in reality they aren’t related at all. DASH and DSH both are unique coins that have unique functions and different founders. Each of these coins are similar in the fact that they have anonymous sender qualities, although each one uses a very different method to achieve these results. Anonymous cryptocurrencies are a favorite choice among a very large group of users that believe completely untraceable transactions are the future. There has been a very large demand for anonymous cryptocurrencies in illicit black market deals, but it also serves a brighter purpose by allowing anyone to engage in transactions without ever worrying about being traced by a third party organization or hacker. People simply prefer to have their transactions completely anonymous – it removes any chance of information getting lost or stolen by identity thieves. Anonymous cryptocurrencies are being supported by some of the world’s biggest banks, including JP Morgan. To them, it is the way of the future due to its benefits to both the user and the organization itself. DSH and DASH both accomplish this, but are using different methods to achieve the results. 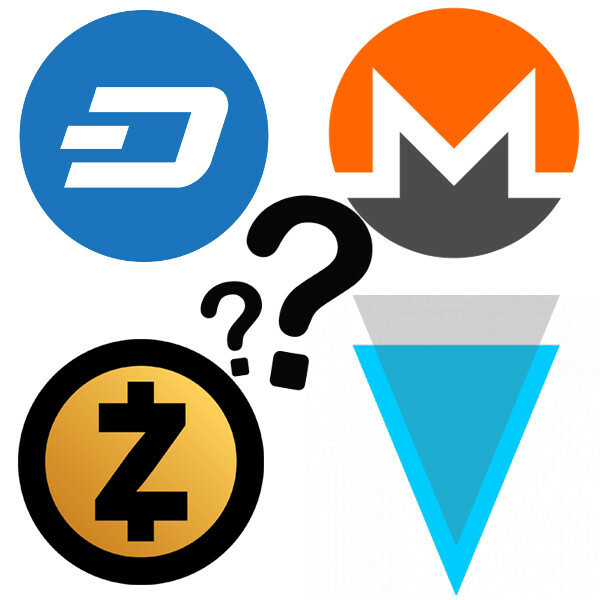 Dashcoin is often confused by users of Dash that are trying to trade their holdings and see DSH come up on the list of currencies. Dashcoin is completely unrelated to Dash, and is actually derived from an older coin called Bytecoin. Bytecoin uses what is called cryptonote, a form of scrambling and obscuring addresses and send logs. This method uses what are called ring signatures and one-time use addresses that are generated for every transaction. Dash, on the other hand, accomplishes the same thing but through a completely different mechanism called “darksend”. This a method that blends multiple transactions together to anonymize transaction ID’s. Ring signatures and darksend are both two sides of the same coin. Ring signatures are used by a family of coins that all incorporate anonymity into their functionality as an option, these coins include Monero, Dash, and ShadowCash. This method allows users to “sign” transactions anonymously as a group. The code is based of of CryptoNote algorithms that block any chance of revealing identity or any info related thereof. Any member of this group (who all possess private keys) can sign for a transaction and verify it without compromising their identity. Basically, a ring signature is an endorsement from another member of the group. In addition, they also use one-time addresses to represent transactions, therefore further removing any traceability or identity associated to a transaction. Originally, this method was conceptualized as a means to allow high-ranking government officials to sign paperwork and verify information remotely without compromising their identity. Darksend works similarly, but rather than just using signatures, it mixes all aspects of a transaction and the addresses that are tied to it. Darksend works similarly to Coinjoin, which simply mixes different coins within a wallet to hide private information. This process mixes and hides IP address, the type of coin sent, wallet origin, and also is run in a decentralized fashion which dis-incentivizes fraud or improper management by owners. Darksend has even been recently improved to Darksend+, an upgraded and even more efficient version of the protocol. Both of these currencies have similar functions, but the verification and mining process have much different requirements. Dashcoin, the Bytecoin derivative, is much easier to mine than Dash. This protocol only requires an average CPU setup and processing power to participate in the mining community. At the time this article was published, 100 DSH is equivalent to about a $0.25. Dash, on the other hand, requires much more processing power to mine and verify, especially transactions that utilize the darksend protocols. This process requires multiple steps of obfuscation that causes an increased demand in processing power. In addition, Dash uses proof of work mining verification like Bitcoin does, a process that has been widely proven to not be energy or processing power efficient. Proof of work requires miners to compete to verify transactions, rather than unanimously cooperate to verify transactions like the new and improved proof of stake protocols enable. Overall, Dash and Dashcoin are only similar to one another by name. The entire underlying framework and technology of each platform is completely unique. Dashcoin is a child of an anonymous cryptocurrency venture known as Bytecoin that is aiming to provide an “automatically mutating” anonymous cryptocurrency. They based their code off of the popular cryptonote technology, and do not place any trust in developers due to the decentralized nature of the coin. Dash can also provide the anonymity that DSH provides, and it also uses the same verification protocols that bitcoin utilizes. Both of these characteristics make the currency slightly less efficient both mining and sender wise. Dash is not solely an anonymous cryptocurrency, it simply implemented an anonymous option for users. Some users advocate for its use, but the vast majority of transactions that occur on Dash do not even use the Darksend option. Dash has great marketing, is a top cryptocurrency offering in most exchanges, and is very simple to use, The main complaint by the community at large is its ability to scale and efficiently complete transactions in a timely manner. Many have suggested that Dash needs to adopt updates like Ethereum and Bitcoin have undergone to be able to scale. So far, Dash has been able to efficiently solve these problems and achieve a huge improvement to transaction speed, something other cryptocurrencies have not been able to achieve. Dashcoin is currently only offered on a single exchange, making it difficult to offer value to users apart from anonymous transactions to other coin holders. Until the coin can scale, gain more adoption, and join more exchanges and wallets, it will pale in comparison to the use and functionality of Dash. In the battle of anonymous cryptocurrencies, both of these entities are making big strides to offer completely anonymous yet efficient transactions while battling heavyweights such as Monero and ZCash.